Our Amore Beds mattress review highlights this new hybrid coil and foam mattress that has been recently introduced onto the market. Save over $150 on an Amore by clicking here! The Amore Beds mattress comes in a variety of different mattress firmness options as well as including the ability to have different firmnesses on each side of the mattress, something we really like as a couple. The Amore mattress is a 12″ foam, latex, and pocketed innerspring coil mattress made up of 4 layers. 2″ Top Comfort Layer – This layer is 1″ of graphite – infused memory foam which provide responsiveness, comfort and cooling to the mattress. An additional 1″ of pure wool is sewn into the top cover. 4″ Transitional Support Layer – This layer is 4″ poly foam that provides additional comfort and support for the mattress and provides transition for the support springs below. 4″ Support Layer – This layer is 4″ of pocketed coils which provide support and pressure relief, as well as assist with cooling the mattress from increased airflow through the mattress. 2″ Foundation Layer – This layer is 2″ of high density base foam that provides support for the mattress as well as deep compression support for the body. The cover of the Amore mattress is made up of bamboo rayon which is often found in much more expensive mattresses. It has a nice soft feel and also provides breathability. We especially like the feel of the cover as it is quite comfortable luxurious. The mattress we reviewed included the option of a therapeutic copper-ion infused cover, which provides anti-microbial and anti-fungal benefits to the mattress, removing odor and helping your skin. The Amore Beds mattress comes in several firmness options, soft, medium, and firm, as well as the ability to split the mattress and have individual firmness settings for each side. We tested a medium firmness Amore mattress, without the individual split sections, as our firmness preferences tend to be around the same these days. The medium felt like a true medium, coming in around a 5-6 out of (10 being the firmest). As I am significantly heavier than Kaye, at around 230 lbs, I tend to press through the top comfort layers and feel more of the support layers in most mattresses. 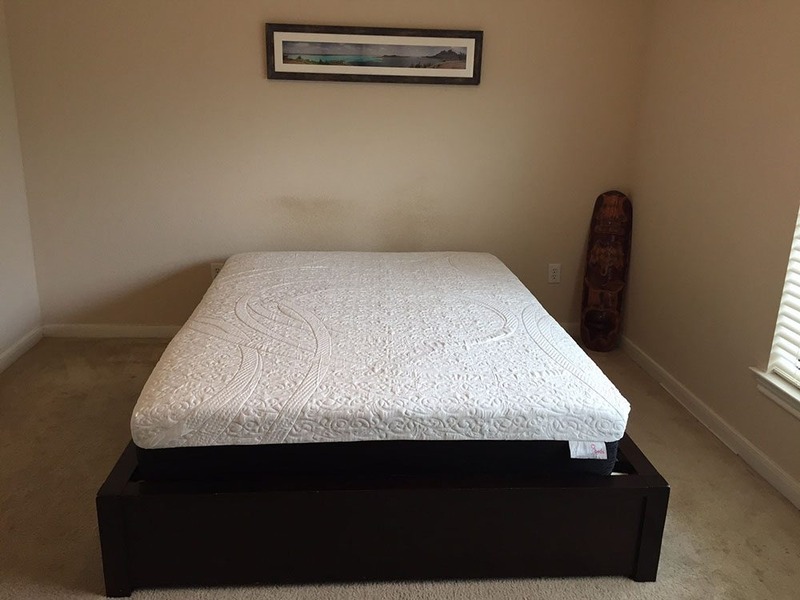 However, this was not the case with the Amore mattress, with the comfort layers providing a good amount of support and comfort and the underlying coil support layer doing the “heavy lifting” in my case. The Amore Beds mattress does a really good job at supporting both my heavy weight as well as Kaye’s lighter weight for all our sleeping positions, without causing me to sink in or depress the mattress very much even with y heavy weight. The Amore Beds mattress is a quite comfortable mattress. The Amore Beds hybrid coil and foam construction does a great job of providing the contour and body hug that we like of traditional memory foam, but without the “stuck” feeling that often happens with all foam mattresses. The inclusion of the coils in the support layer of the mattress does an excellent job at supporting my heavier weight as well as our combined weight as a couple. With some hybrid mattresses, the coils tend to stick out the side of the mattress and are too bouncy for our taste, but with the Amore we could not even tell that it had coil construction – a plus for us. The soft exterior cover of the mattress, combined with the upper foam comfort layers, made for a very comfortable sleeping surface. The Amore Beds mattress does a very good job at not sleeping hot due to the hybrid foam / pocketed coil construction they utilize which helps minimize heat retention. The Amore Beds did not cause us to have that sticky feeling that we often experience with some foam mattresses on the market, which is a great advantage of the hybrid foam/ coil design. The Amore mattress does a good job with sinkage and motion transfer. As we always preach, sinkage (and motion transfer) is largely weight dependent. The fact that I am a heavier sleeper and weigh around 230lbs tends to have a significant bearing on the degree of sinkage I experience when sitting and lying on a mattress. By contrast, Kaye, who weighs much less than me, tends to experiences much less sinkage than I do. The Amore Beds mattress does a good job at supporting my heavier weight from the use of the pocketed coil construction, resulting in the mattress not “bottoming out” when I sit or lie on the mattress. Edge support is also good with the Amore Bed, which supported my heavier weight quite well when sitting near the edge as well as sleeping near the edge. This is something that often is an issue for me as as larger, heavier sleeper. There was some motion transfer when moving due to the nature of the mattress design, with latex and coils inherently causing more motion as a result of their responsive nature. It wasn’t excessive, however, compared to traditional innerspring mattresses or some of the coil/foam hybrids we have tested. Neither Kaye nor myself felt any big disruption in our sleep or shaking of the mattress when each other changed positions or got in or out of bed during the night. The Amore Bed had an average amount of smell upon opening the box. This did not persist for too long and was largely absent the next day, but we did notice an average amount. This is typical for mattresses that have foam construction due to the off-gassing of the foam components. The Amore Beds mattress is priced more reasonably than most mattresses we have tested for all the features they offer. Coming in at $775 for a Queen , which is a good price given the quality materials and construction used in this mattress. The addition of the copper-ion infused cover adds $50 to the cost of the mattress. The Amore Beds mattress is a great hybrid coil, latex, and foam mattress that does a great job of delivering comfortable, cool, sleep at a great price. The option of multiple firmnesses as well as the ability to split the mattress into different firmness options for each side is a great option for couples with different firmness preferences. The materials, construction and the design of the Amore Beds mattress all work together to provide a very comfortable yet supportive mattress that is ideal for all sleeping positions as well as for couples. The Amore Beds mattress provides the classic memory foam feel of body hug and contour without feeling trapped in the foam like other all foam mattresses, without the sinkage or problems with edge support for heavier sleepers that many other similar mattresses have due to the hybrid pocketed coil construction. We are very impressed with the quality offered for the price of the Amore Beds mattress and highly recommend it. Hopefully this Amore Beds mattress review was helpful in your next mattress purchase. Well that’s great! They do get good reviews so glad you are happy!